Baby walkers are an unnecessary and dangerous product, pediatricians say. Pediatricians have long warned about the dangers of baby walkers — once a staple in homes with small kids. But thousands of children continue to be hurt by the products in the U.S. each year, a new study has found. Almost 231,000 babies younger than 15 months were treated for walker-related injuries in emergency rooms from 1990 to 2014, averaging more than 9,000 kids per year during that period, according to the paper published Monday in Pediatrics. About 90 percent suffered from head or neck injuries, and almost three-quarters were hurt after falling down stairs. The number of babies harmed has been dropping, but infant walkers continue to be an “important and preventable” source of injury for young children, noted lead author Dr. Gary Smith, director of the Center for Injury Research and Policy of The Research Institute at Nationwide Children’s Hospital in Columbus, Ohio, and his team. Baby walkers are an unnecessary and dangerous product, said Dr. Benjamin Hoffman, professor of pediatrics at Oregon Health & Science University and chairman of the American Academy of Pediatrics Council on Injury, Violence and Poison Prevention. After the AAP began calling for a ban on the sale of baby walkers in the U.S. in the 1990s, voluntary safety standards were adopted to reduce falls down the stairs: The walkers had to be wider than standard doors or stop if the wheels dropped over the edge of a step. The number of injuries plummeted 84 percent from 1990 to 2003. The trend continued after a mandatory federal safety standard was put in place in 2010, with the average annual number of infant walker–related injuries dropping to 2,165 over the next four years, a 22 percent drop compared to the previous four-year period. Still, Smith and Hoffman support a ban like the one in Canada, which became the first and only country in the world to prohibit baby walkers in 2004. It’s against the law for anyone to sell, advertise or import the products in Canada, whether new or as a second-hand item. 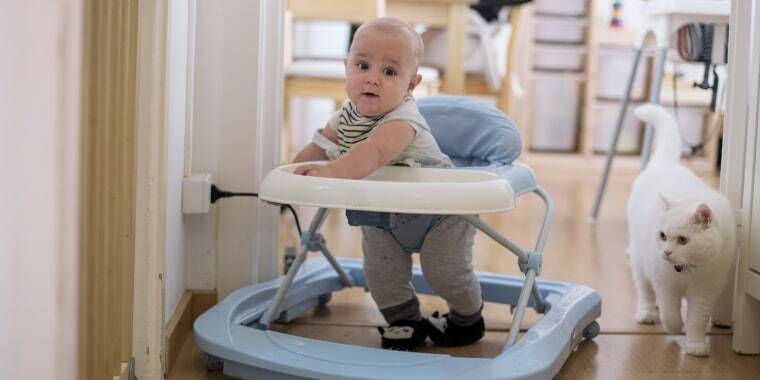 Hoffman believes families are lulled into a false sense of security when they can still purchase baby walkers in the U.S.
Parents may think the products help kids learn to walk more quickly, but studies show they can actually delay mental and motor development. If you are thinking about buying a baby walker, please don’t, the experts urged. “Things happen in an instant, kids are quick and impulsive and parents get distracted even in the most perfect situation,” Hoffman said. “There’s clearly risk for serious injury — parents should not use them,” Smith added. If you have a baby walker at home already, don’t use it. Dismantle it and get rid of it. Don’t sell it: “You don’t want anyone else using it, it’s a dangerous product,” Hoffman advised. Consider a stationary activity center instead. It allows babies to bounce, swivel, rock and occupy themselves in a protected, self-contained space. The lack of wheels prevents them from scooting across the floor and getting into harm’s way, Smith noted. “If there’s not a walker in the home, there’s a zero percent chance that a child is going to be injured in a walker,” Hoffman said.